Our new opportunities include another school to investigate in our future, at least three new areas to tour, an out of state adventure by invitation, and 9 private investigations. If you are interested in an investigation in your area or a possible tour of your hometown, please let me know. Especially if it is in Columbiana County! P.S. 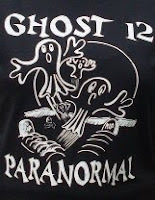 If you haven't noticed, our shirts say Ghost 12 Paranormal. It was a printing error, but I think that everything happens for a reason, so we left our first shirt this way. We have been blessed in more ways than one because of this. Future shirts will say Ghosting 12, but that is the future. That is fantastic! Our local groups does a lot of benefit things, especially for our cemetery association for upkeep of the cemeteries. Sometimes, when we have workshops, I like people to bring trash bags and clean up the cemetery while we're there. Good intentions and good manners actually pay off in investigations which I call karma.